Whether you are growing outdoors, indoors or in a greenhouse, regardless of its location you will really need grow lights. 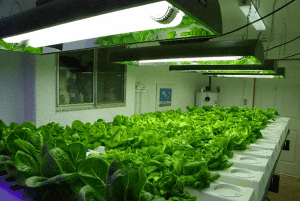 The reason why we created this guide to Indoor Aquaponics Grow Lights is because this topic can be very confusing and more often than not it gets filled with hype. 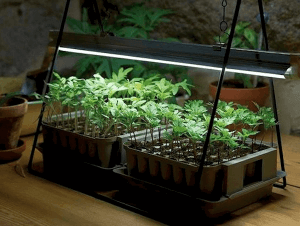 We hope that this guide will shed some light on the actual facts and assist you in creating a light setup that is suitable for your own growing environment. We also would like to thank IndaGro and Sunlight Supply, both of which are frequent dealers of ours for their valuable contributions. What is the distinction between light that is specifically made for plant growing and visible light? Even though the sun is by far the best grow light that has ever been invented, plants use only a part of that light for the purpose of photosynthesis. PAR or the photosynthetically active radiation encompasses around four hundred and seven hundred nanometers and it also falls within the visible spectrum that is (three hundred eighty to seven hundred seventy nanometers). Humans see a total visible spectrum as white light but thanks to prism the white light that we see is in point of fact separated by a wide spectrum of colors from green, orange, red, yellow to violet and blue. In general, plants only use the blue to red light as their source of energy for photosynthesis. 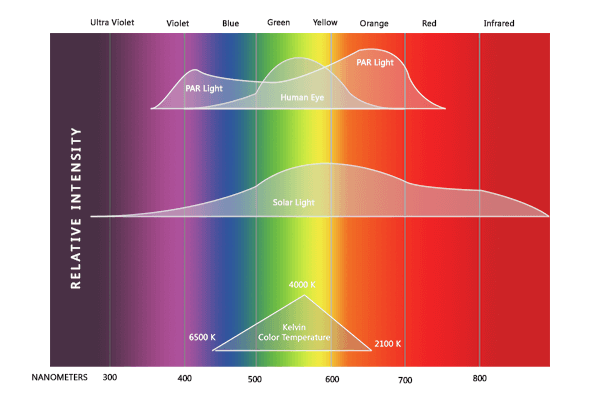 What do the terminologies Lumen and Color Temperature (k) mean? Lumen stands for the measurement of light output. Lumen indicates the amount of light radiated by a candle that falls on 1 square foot of surface located at a distance of 1 foot from the candle. Usually, lumens serve as the scale of a lamp’s capacity to grow plants, this means that the brighter the lamp the healthier the plant. But studies have revealed that a much broader color spectrum lamp can outperform lamps with a high lumen output most especially if you’re talking about plant growth. Color temperature, on the other hand, does not measure the warmth or the hotness of the lamp. Color temperature is the relative whiteness of a tungsten steel heated to a specific temperature in degrees Kelvin. Take for instance, HPS or High-Pressure Sodium lamps emit a warm red color temperature of 2700K compared to MH or Metal Halide of 4200K that has a cool blue color temperature. There are also daylight spectrum bulbs available that almost mimic the temperature of the sun at 6500K. HID lighting or High-Intensity Discharge is a special kind of lighting that is brighter and much more intense than any other type of lighting there is. An HID lighting system comprises a socket and lamp or a light bulb, a reflector and ballast. The function of ballast is that it acts as an engine that converts and drives energy to bright light to the lamp. Other options for HID lighting include Metal Halide or MH, Low-Pressure Sodium, High-Pressure Sodium and Mercury Vapor. The two most used systems for plant growth are Metal Halide Systems and High-Pressure Sodium Systems. What is the difference between HPs and MH when it comes to plant growth? HPS lamps offer more orange/red/yellow spectrum, which is the ideal spectrum for the majority of plants that are actively flowering and fruiting. Furthermore, HPS lighting is the lighting of choice for growers who are looking to supplement their plants with natural light. MH lamps, on the other hand, offer more of the green/blue spectrum. This spectrum is ideal for leafy crops and plants that are in their actively growing stage or vegetative stage. MH lamps offer a more natural look in terms of color and they are also generally the lamp of choice for plants that have very little access or no access to natural sunlight. 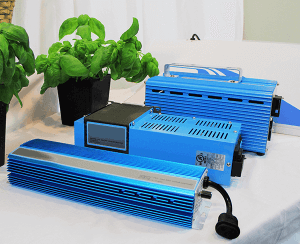 What are the main differences between Electronic or Digital HID ballasts and Magnetic HID ballasts? The most obvious differences between electronic ballasts and magnetic HID ballasts are the frequency output of the lamp as well as the energy conversion from electricity to usable light. Electronic ballast differs from one manufacturer to the next. However, the frequency it produces can be four hundred times more than that of magnetic ballast. Magnetic ballasts are able to generate a frequency of around sixty Hz. Magnetic ballasts generate more heat compared to electronic ballasts making them more efficient when it comes to converting electricity to usable light. But, a word of caution, don’t expect to save up on your electricity bills. Saving money on your electricity bill won’t be possible if you are using electronic ballasts. The reason is simply because your power bill is based primarily on kilowatt-hours and not on efficiency. Again, this means that a one thousand watt electronic ballast will probably cost you the same amount as a one thousand watt magnetic ballast to operate. 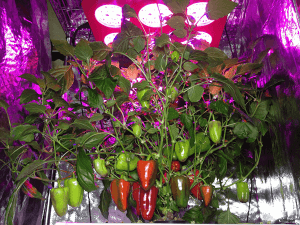 What is the difference between Fluorescent lighting and HID in terms of plant growth? 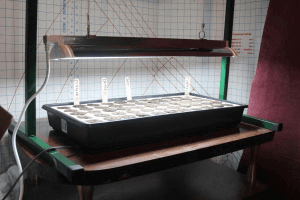 Usually fluorescent lighting was primarily used for cuttings, seedlings and plants that have low light level requirements. HID, on the other hand, were mostly used for established plants and those plants that have high light level requirements. But the good news is that because of advances in fluorescent lighting technology we can now have more options for horticulturists. The latest in the plant growth lighting to date is T5 fluorescent lighting. The high-light output of T5 as well its low energy and heat consumption has made it an ideal light source to grow a wide spectrum of plants. What will be the benefits should you choose to go for T5 Fluorescent lighting when it comes to plant growth? Did you know that T5 lamps offer the best spectrum for plant growth? Well, after years of research and experimentation, growers have discovered that this is the ideal lighting for plant growth. You see, photosynthesis rates reach its highest peak at four hundred thirty-five nanometers and six hundred eighty nanometers. A 6500K T5 lamp has an impressive spectral distribution with an intensity peaks at four hundred thirty-five nanometers and six hundred fifteen nanometers. If you come to think of it, this is already equivalent to very little light energy wasted when talking about plant growth. T5 lamps encourage impressive vigor and health of cuttings and seedlings. Root development is also far more superior compared to other lighting sources that are not T5. T5 lighting is very good for starting cuttings and seeds and it is also able to generate enough light needed for full term growth. And since T5 lamps have very minimal heat output, these lamps can be placed six to eight inches above the plant canopy, this means it maximizes photosynthetic response. 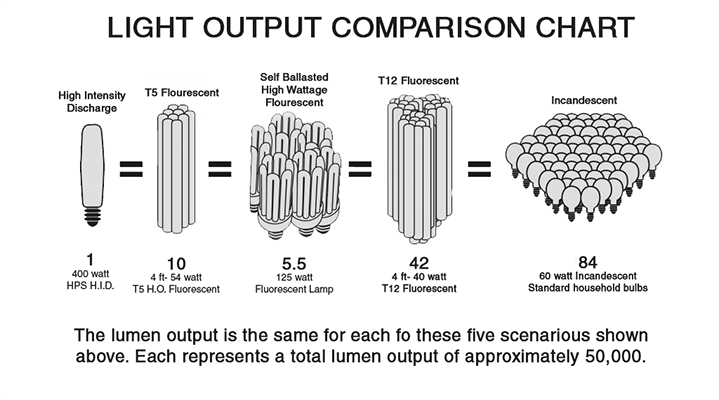 Compared to other plants that are grown under conventional fluorescents, plants grown under T5 lamps do not need to be rotated to the very center of the lamp. The slim diameter of a T5 lamp versus T8 and T12 allows better photo-optic regulation of the radiated light thus boosting its efficiency in the form of even distribution of light. What is the difference between T5, T8, T12 and Compact Fluorescents? T5, T8 and T12 are otherwise known as linear fluorescents because they are shaped in an elongated tube, the ones we are commonly familiar with. When the number is higher it means the bulb is bigger. T12 are the conventional shop light bulbs while your T8 bulbs that are used in commercial buildings are being converted over to because they are able to save more energy. The T5 light bulbs are the existing standard in grow lighting simply because these bulbs are thin that you can easily fit up to four of these bulbs in every foot of width in a single fixture, which means it offers terrific light intensity. CFLs or your Compact Fluorescents can pack a minimum of T5 grow light tubing in a tiny space by bending and coiling the tube. Standard lighting fixtures in households use twenty-six and thirty-two watts of lower wattage CFL grow lights. While the higher wattage CFL like the one hundred twenty-five and two hundred watts need specialized fixtures that are same as HID reflectors, however the ballast is included in the hood. What are the benefits of using LED lights? 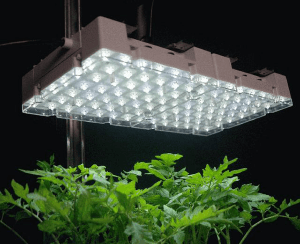 LED or your Light Emitting Diodes are perceived as the future of plant-grow lighting. The reason for this is because the manufacturers of LED are obtaining better control over the spectrum of light that are emitting out of LED fixtures by fine-tuning the range of LED’s on the panel. Compared to HID fixtures, your LED fixtures are more energy efficient . Take for example since more the energy or wattage that goes into the fixture is converted into usable PAR light energy. Aside from this another advantage of using LED fixtures is the fact that the bulbs do not have to be replaced, ever. As a matter of fact, Black Dog fixtures offer a limited lifetime warranty. What are the benefits of Induction Lighting? Your induction lighting share more or less the same benefits as your LED lights. Like your LED lights, induction lights are energy efficient and their bulbs need not be replaced as well. Aside from these induction lightings also has a long warranty like our Inda-Gro fixtures that offer ten years worth of warranty. Induction lights also run cool and they are able to convert up to ninety-five percent of your wattage that goes into them and turns them into PAR usable light. Although one thing to take note, your induction lighting are far more expensive compared to your HID fixtures and your T5 lighting but are less costly compared to your LED. The nice thing about induction lighting is that it grows plants really well. How does Induction Lighting function? Your Inda-Gro Induction lamps are the kind of High Output Fluorescent lamp that is known as EFDL or Electrode-less Fluorescent Discharge Lamps. They are different from the traditional lamps that need screw in their sockets or those that require pins to power up the lamps. The difference here is that your Electrode-less Fluorescent Discharge lamps do not depend on a socket or a pin connection to fire up the lamp. Instead, your Electrode-less Fluorescent Discharge lamp efficiencies stem from being powered by a High-Frequency Electromagnetic Field. Since your EFDL do not use ballasts, sockets or pins to operate the lamp consequentially more energy is converted to usable plant light and so none is wasted due to increased temperatures and escaping gas inefficiencies that are inherent of lamps that need electrodes. The Electrode-less Fluorescent Discharge Lamps were first patented and introduced in 1891 by Nikola Tesla. Although induction lamps are expensive they were always treasured with high regard for their high lumens per watt, their crisp color, their low lumen depreciation, their low operating temperatures and their long lamp life over the course of its shelf life. The Electrode-less Fluorescent Discharge Lamps of Inda-Gro have efficiently combined the benefits of this technology with distinct spectral requirements that are so important for a healthy plant development. The custom horticultural phosphor blends of Inda-Gro are created as a main grow light from vegetative through the budding and flowering phases. Furthermore, these fixtures replace the need for lamp changes that are usually linked with different growth stages. Can I use an incandescent bulb instead? Just to clarify, the common household bulbs do not radiate sufficient amounts of light or the appropriate spectrum that are used by gardening aficionados. Therefore, these are not very efficient and they use a significant amount of power for the light they radiate. Your standard household bulbs normally have only fifteen lumens per watt. Below is a Sunlight Supply Chart or simply put, a light output comparison chart that will show you the output of some of the known lighting options available. How much energy will my light require? Majority of gardeners makes use of twenty-five watts per square foot of garden space at a minimum irrespective of the type of grow light. 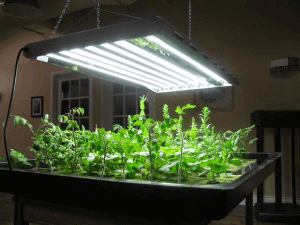 But if the light you use is there to supplement natural sunlight then you may need less than that or if you care growing a plant like lettuce that does not need that much light. But a lot of gardeners opt to use twice or thrice the suggested wattage to obtain more efficient growth rates. These gardeners are well aware that there is no such thing as having too much light. However, if you use large light in a small area it will sometimes lead to higher temperatures that would be difficult to manage and control. Always keep in mind that plants, like humans, also require some periods of darkness. The majority of indoor gardeners use lighting from twelve to eighteen hours in a day. A typical lighting system will normally boost your electricity cost from around eight dollars to twenty dollars in a month. The exact amount will depend on the wattage of your system and the number of hours used in the operation. For you to calculate your cost, all you need to do is to multiply your bulb wattage with the number of hours used in the operation. Once you get the results divide it by one thousand. The answer is the number of kilowatt-hours of electricity used. Take for example a four hundred watt lamp that ran for eighteen hours will likely use 7.2-kilowatt hours. You can check on your power bill for the amount of each kilowatt-hour. And then multiply the number of kilowatt-hours used by the cost of a kilowatt-hour to know the cost to run your light for that number of hours. 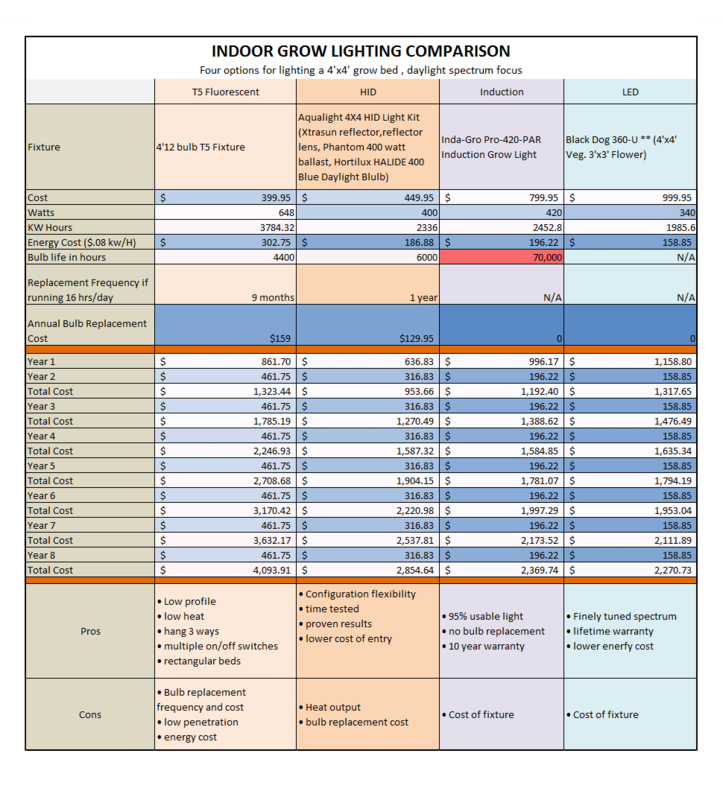 How do you compare the initial and ongoing costs of your grow light options? There are actually 3 factors that add up to the cost of a grow light, one is initial set up, two is the energy and three is the bulb replacement cost. We made this chart to display the cost of operating four kinds of lighting solutions for a four-inch by four-inch grow bed in Longmont, CO would turn out to be in an eight-year period. Am I going to need special wiring in my house for my lighting system? It is important to know that lighting systems have corresponding voltages and there are a variety of voltages available for every lighting system you may have. The typical one used by the majority of gardeners is 120 volts for every 60 Hz, this plugs directly into a standard wall outlet. There are also other voltages that may need special receptacles and circuits. But keep in mind that you need a licensed electrician if the light you bought has special voltage requirements and do not exceed more than seventy-five percent of the rated ability of the breaker or fuse. Take for instance; do not use more than fifteen amps on a 20-amp circuit. What voltages are available for Fluorescent lights and HID lights? The voltages for Fluorescent lighting varies but most of them are available from one hundred to two hundred seventy-seven volts and fifty Hz or sixty Hz. Meanwhile, HID systems are available in one hundred twenty volt, two hundred eight volt, two hundred forty volt, two hundred seventy-seven volt and four hundred eighty volt – all of these are at sixty Hz. Can I save on my electricity bill if ever I run my system with two hundred forty volts? The answer to that will have to be a no. Most electric companies base the cost of your electric bill on Wattage and not on Current or Voltage. Even though ballasts wired for two hundred forty volt will need less current and will run a tad cooler compared to the one wired for one hundred volt, unfortunately, it will not save you on your electric bill cost. How often should I change my light bulb or light bulbs? Majority of lamp manufacturers rate their lamps according to their average life hours and they normally claim ten thousand to twenty-four thousand hours. The ratings are based on when the lamp will fail to come on. These ratings do not factor in the loss of color or loss of intensity. Your T5 lamps and your HID lamps both lose color and intensity through regular use. And this is perfectly okay if you are lighting a warehouse but in terms of plant growth, these apparent losses could mean poor plant performance or wasted electricity. Avid horticulturists suggest that you change your HID lamps after using it for six thousand hours. This is equivalent to using your light sixteen hours in a day for a whole year. Your T5 lamps also need replacing after four thousand four hundred hours or equivalent to sixteen hours of use per day in a total of nine months. How long should I be running my lights? The answer would have to depend on the type of plants you have whether or not they have access to natural sunlight in your garden. To determine what kinds of plants to grow in your system, we suggest reading our blog post Aquaponic Plants. As a rule, when you are in the vegetative stage and you have no access to sunlight you should run your light for fourteen to eighteen hours in a day. But if you have access to natural sunlight then the amount of time for you to run your light will vary depending on whether your sunlight is direct or not. We often suggest that you do an experiment to figure out the best length of time for you to run your lights. If your garden is actively flowering and fruiting then our general rule is for you to run your lights for twelve hours in a day assuming that you have no access to natural light. How high can I hang my lights over my plants? Our general rule for the exact hanging height of an HID lamp is twelve to forty-eight inches depending of course on your wattage. 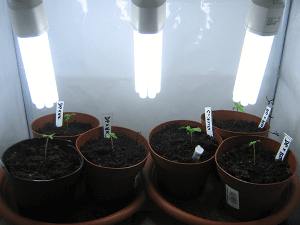 Since LED, Induction lights and Fluorescent emit less heat you can place them much closer to your plants. However, just ensure that you monitor for excessive heat at the top of your plants. You can do this by placing your palm down over your plants. If the top of your hand becomes hot then you need to adjust the placement of your lamp and put it a bit higher. If your light source is too near there is a big chance that you might burn your plants. Always remember that as your plants grow in height you also need to adjust the height of the lamp because the least you’d want to happen is to burn your plants. The higher your wattage the farther you want the light to be from your plants because of the amount of heat it emits. HID lighting can be placed further away compared to a fluorescent because of this explanation. When you mount your lighting fixture always consider the type of plant you have and how tall it can grow. As much as possible you want to keep your light as close to the plant as you can but not too close that it will actually burn your plant. To be safe here’s a simple rule that can serve as your reminder: if it feels comfortable at the back of your hand then that is a safe distance for your plants. You can also do a bit of research on the type of plant you want and where these plants come from, as this will determine how much light your plants will need. Also pay attention to fast-growing plants. For plants with a fast growth rate, you may need to monitor the hanging height regularly because if your plant gets too close to your lamp it might get burnt. How much space should my light cover? To answer this question the size of your garden will be the determining factor for the wattage you need. Let’s say that your plants don’t get sunlight then you will need around one thousand watt HID light to cover a seven by seven feet growing area. A six hundred watt will cover six by six feet and a four hundred watt will cover four by four feet and a two hundred fifty watt will cover three by three feet. These sized areas are called Primary Growing Areas. Photo prism is a condition wherein the plants that are placed outside of the Primary Growing area will bend towards the light. We suggest you read our blog post on how to consider the size and area of your Aquaponics system. Can I run a one thousand watt bulb in my four hundred watt lighting system? The answer is no. The internal sections of the ballast are created to send the appropriate current and voltage for the rated lamp. If you mix ballasts and lamps it will result to premature failure and it can cause you to lose your warranty. How can I clean the insides of my reflector? You can clean it using mild dishwashing detergent soap and warm water. Make sure to avoid abrasive cleaners, ammonia and bleach. DIY Aquaponics Systems is designed to serve hobbyists and aquaponics enthusiasts. The site provide readers with information on researches, several projects,how-tos and best aquaponics practices.